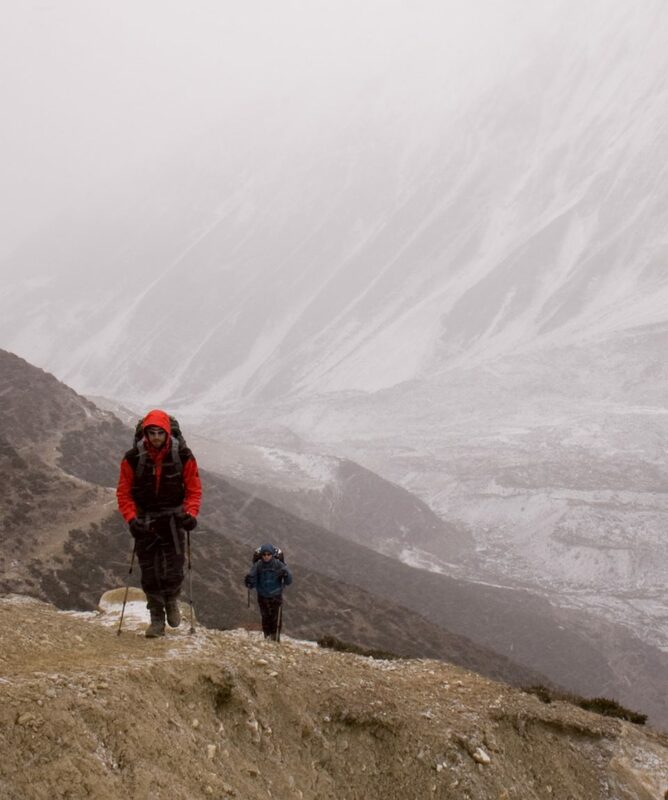 The Manaslu Circuit Trek is a unique trekking adventure in the restricted region. 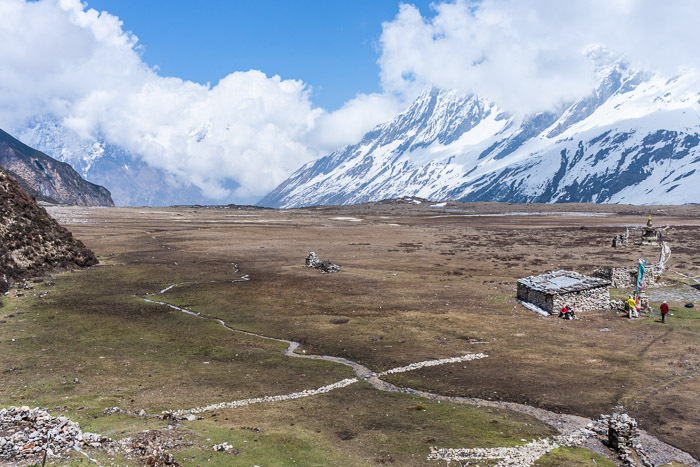 It leads you via the rough Buri Gandaki Valley to Nupri, a valley of Tibetan people behind Manaslu (8163m). 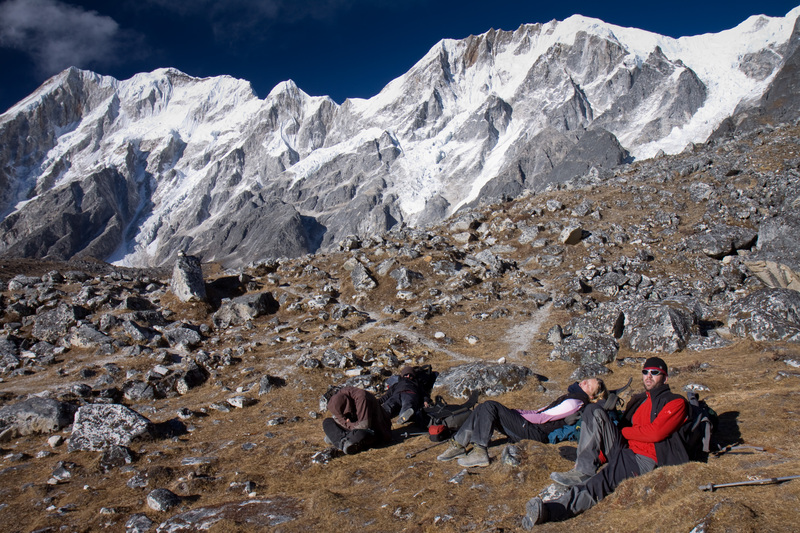 Along the trek, you will have stunning mountain scenery. 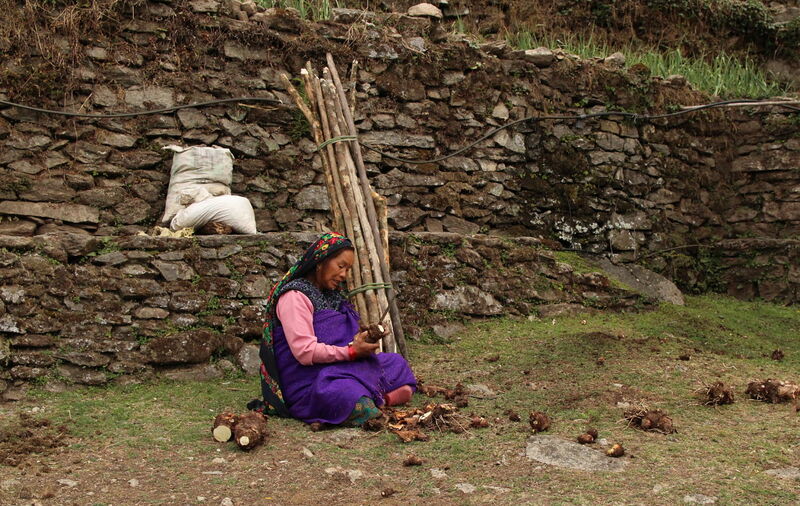 And you trek through and eat and sleep at Tibetan villages and cross the high pass of Larkya La (5100m). 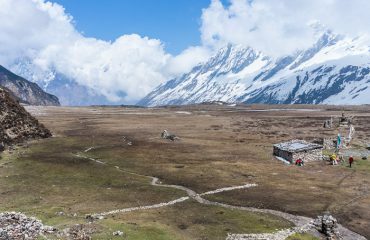 All about the Manaslu Circuit Trek [Larkya La]. Manaslu is the eight highest mountain in the world (8163m). Its name means “mountain of the spirit” which comes from the Sanskrit word manasa, meaning “intellect” or “soul”. Manaslu is located in the Gorkha district, east of Annapurna. 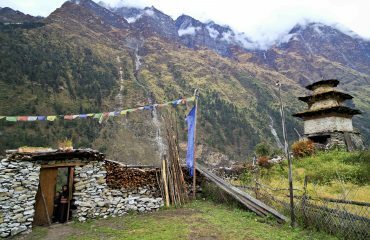 This beautiful trekking route leads you via the Tsum Valley which only opened to trekkers in 2008(!) The Tsum Valley is among the most holy Buddhist areas where mostly Tibetans live. 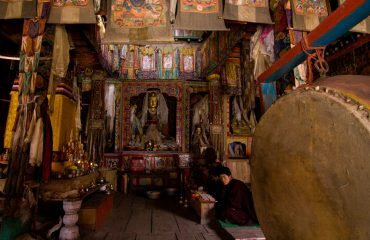 For instance, just behind Samagaon, where you have a rest day, you find the beautiful Kargyu Chholing Gompa which houses a large statue of Guru Rinpoche. If it isn’t enough yet: this route also leads you through forests of rhodondendrons, along many mani walls with prayer wheels with gorgeous views over – of course – Manaslu (8163m), Manaslu North (7157m) and Naike Peak (5515m). 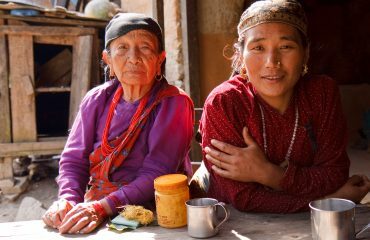 The inhabitants of the upper Buri Gandaki, a region known as Nupri (‘the Western mountains’), are direct descendants of Tibetan immigrants who settled here in the early 1600s. 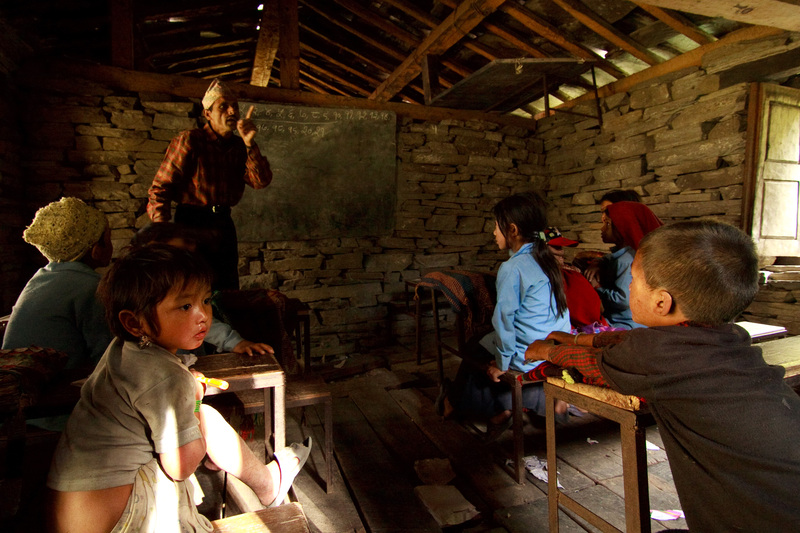 In upper Nupri the speech, dress and customs are almost exclusively Tibetan. Nupri actually paid taxes to Tibet until about 1840 and there is still continuous trade between Nupri and Tibet. 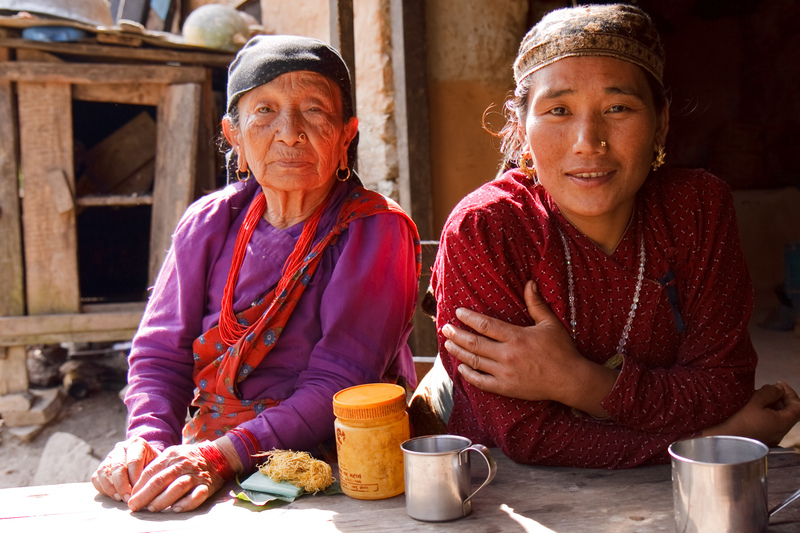 Early morning we pick you up from your hotel and drive to the Gorkha region. 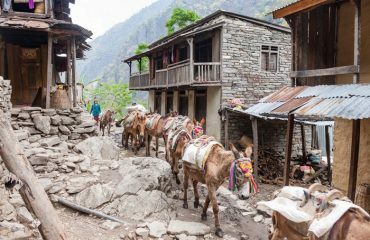 We drive through small villages and bustling bazaars till we arrive in the settlement of Soti Khola (790m) in the Budi Gandaki valley. Today we start our trek. First the trail descends slowly until we climb to the mountain ridge to Almara. Then we pass the forest trail to arrive at Riden Gaon. 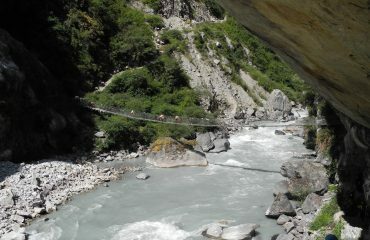 Via the valley, we cross the river to enter Budhi Gandaki. 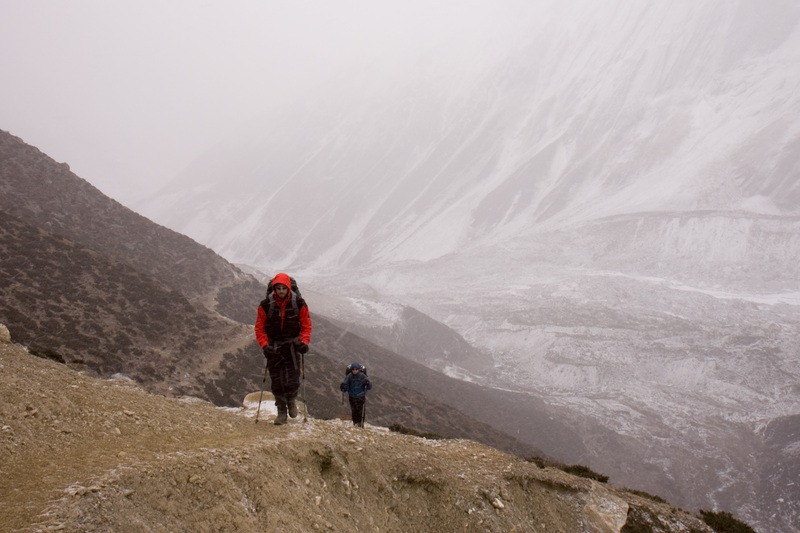 From Lambesi, the trail follows down to the sandy river bed of Budhi Gandaki. After crossing the Machha river and Khola Besi, we reach the hot spring of Tatopani. 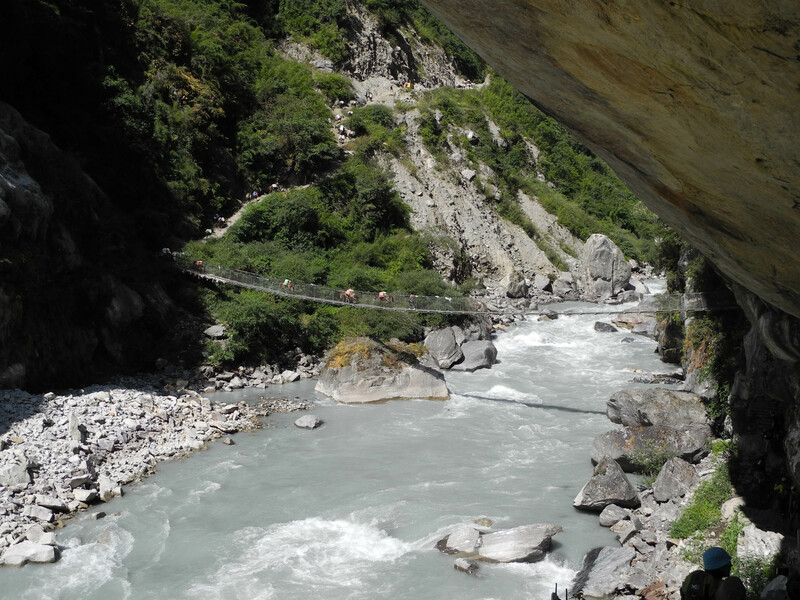 From here the trail follows a forest whereafter we reach Dovan with just below the massive river Budi Gandaki. From here the elevation increases clearly and our view change completely. Today our trail begins by climbing a rocky ridge from where views of Sringi Himal (7187m) appear. We continue through rich terraced fields of maize, potato and millet before we enter the Nupri, the western mountains, via bamboo forests. Tonight we spend the night in the Buddhist village of Deng (1855m). 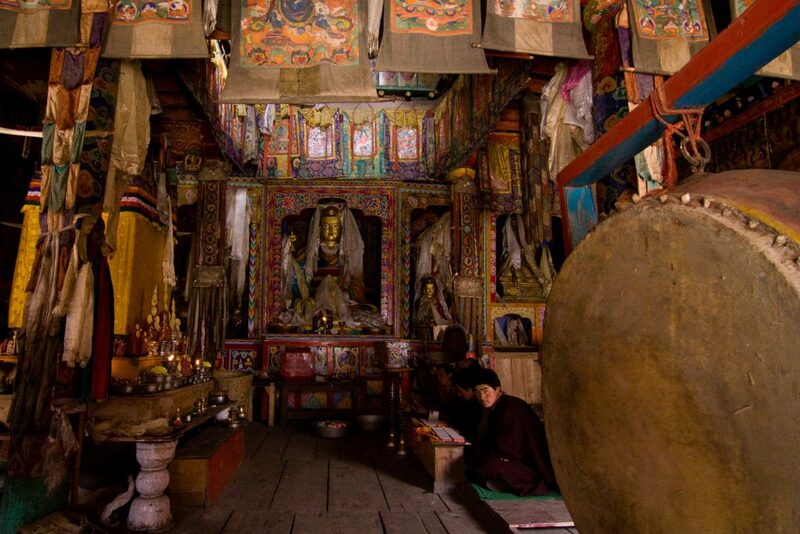 We pass by numerous Tibetan mani walls, intricately hand carved stone walls with Buddhist scriptures. We weave in and out of canyons. An enter into a colourful forest of firs, oaks and rhododendrons until we arrive in the settlement of Namrung (2660m). 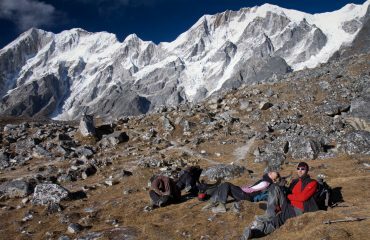 Today our trek climbs steadily into the alpine where we’ll see the first stunning glimpse of Manaslu North (7774m) and Manaslu (8150m). We spend the night at the village of Lho Gaon (3190m) with locals who wear the traditional Tibetan clothes called ’chubas’. Today we have a shorter trekking day which allows us to acclimatize and enjoy the spectacular mountain views and villages along the way. We walk through a gully of mosses and rhododendron until we enter the village of Samagaon (3530m). 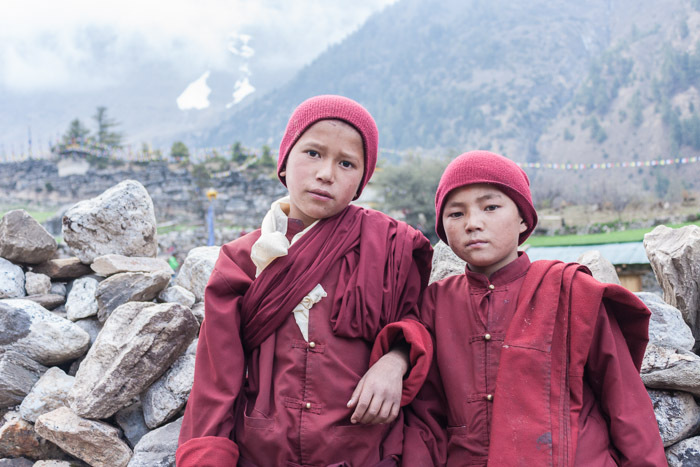 Today we stay around Samagaon and hike up to Pungyen gompa and the glacial lake Birendra Tal. This hike takes us through a forested area before we reach a ridge and a grassy plateau. 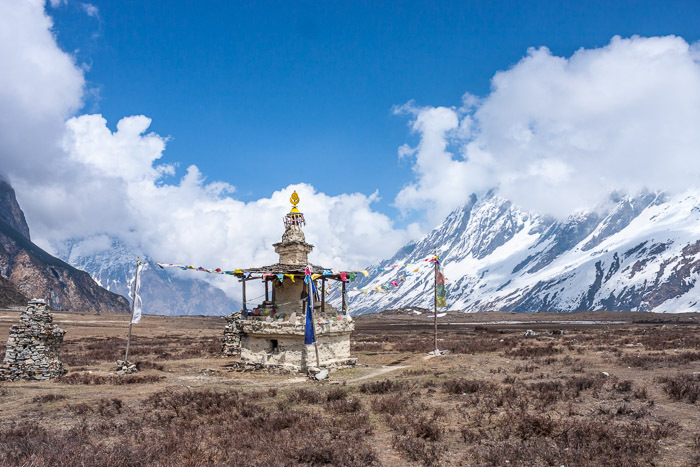 Here you’ll discover the gompa that was destroyed by an avalanche in the winter of 1953. 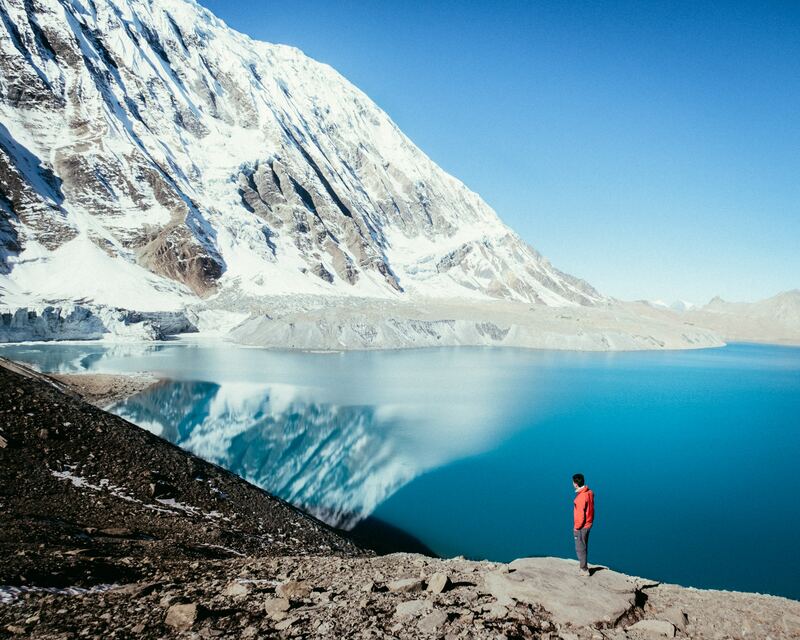 When we continue our hike, we reach the icy waters of Birendra Tal that is situated at the base of a glacier. Today we have another shorter day that allows us to adjust to the altitude. Along the way we pass a land of yaks, plentiful marmots and pastures where only barley and potatoes can grow due the high elevation. Today we finally trek above the tree line. A pleasant walk takes us to the picturesque village of Samdo (3850m) a town that is known for its yak herding. Samdo is also at the convergence of three valleys and is only a one day walk from Tibet. We’ll be quite likely to see traders coming from the valley carrying Chinese and Tibetan goods. 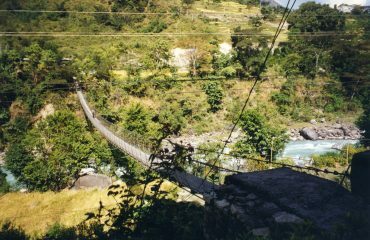 When we continue our trek from Samdo, we follow a wide, broad path, cross the Budi Gandaki river and traverse along a mani wall. Then we climb over the Larkya glacier until we reach a ridge from where we can have grand views over a huge gorge. We spend the night in Larkya Phedi, also known as Dharmashala, before we cross the high Larkya La pass tomorrow. Today is a longer day with a challenging, though not technically difficult trek over Larkya La pass (5100m). From Larkya Phedi we pass a glacial moraine and four frozen lakes as we make our way to the pass. It takes about 5 hours to reach this point. From the pass we can see incredible views of Himlung Himal (7126m), Cheo Himal (6820m), Gyaji Kung (7030m), Kang Guru (6981m) and Annapurna II (7937m). After a short break we start our descent down a trail along a steep gully. Eventually the trail peters out into a more grassy level and we continue our descent to Bimthang (3720m). Today we cross a glacial stream and climb over the side of the moraine descending into a spectacular forest of rhododendrons and impressive pines. Also we are likely getting a view of Manaslu providing an equal amount of splendour. We descend down towards the Dudh (milk) Khola and continue through a more agricultural landscape until we reach the village of Tilje (2300m). Today we have a more rapid descent into the Marsygandi Valley. 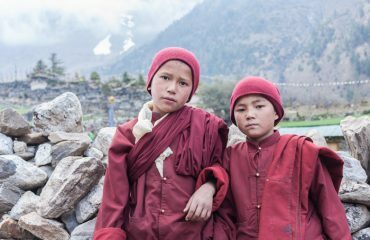 We trek through a forest, cross a suspension bridge and make our way to the well-trodden trail of the Annapurna Circuit. 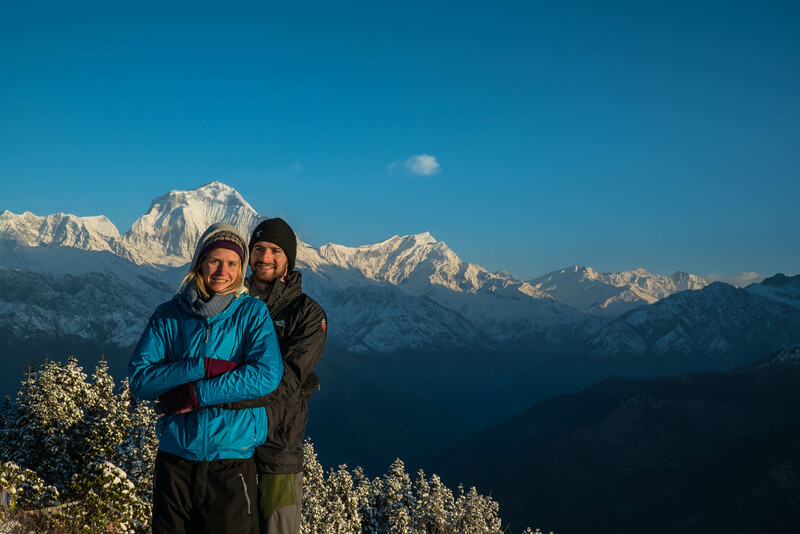 We make our way to Chamche where we stay for the night and celebrate our success of completing the Manaslu Circuit! From Chamje we can either continue trekking or take a jeep to Besi Sahar. Today we take the bus to Kathmandu. 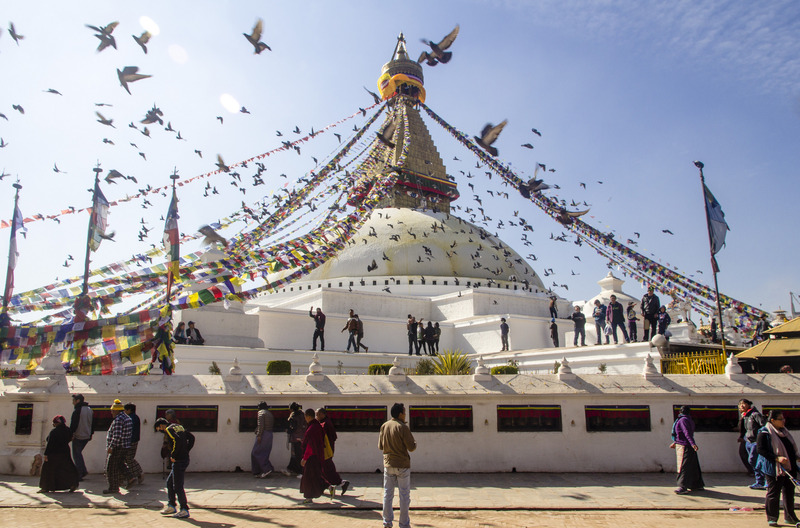 Would you like to extend your holiday and visit the peaceful city of Pokhara? Please let us know and we will change your itinerary. During your Manaslu Circuit trek, you will be staying at basic mountain lodges. Here are double rooms and shared bathrooms. 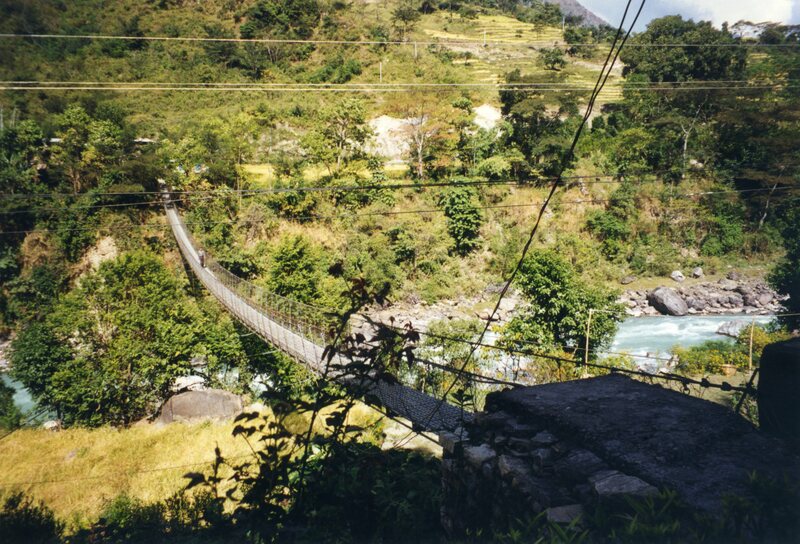 Suspension bridge at Jagat by Jeanne M.
Stupa along the Manaslu Circuit trek by Zabara A. "Our hosts" by Petr M.
Lho Gaon by David W.
"Teacher teaching us how to count to 100" by Petr M.
"On the way to Dharamshala" by Petr M.
"Tired, we are really tired." by Petr M.
De Chamje (1,350 m) Timang (2,200 m) by Jerome B.